In case you were suspicious that my blog was going to turn into an all-out sentimentality-fest with lots of uncomfortable monologues about unconditional love and babies and crap, never fear! 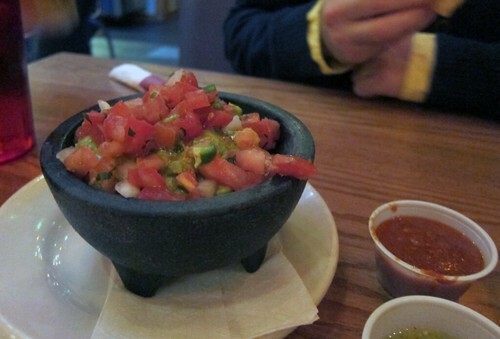 I’m back on solid ground with a post about food. Birthday food! By which I mean, tacos. Naturally. I’ll get to them in a second, I promise. Last Friday, I turned 26. I feel surprisingly neutral about this birthday, even though I’m officially closer to 30 than 20 now. Or maybe I just haven’t had time to stop and think about it – my excitement over Teddy’s birth kinda eclipsed my own mopey musings on aging. But I think I’m okay with 26. It’s a solid number, respectable, even. I feel good about where I am in my life and the people I share it with. And that’s what really matters, right? Happily, I shared an early birthday celebration with most of my immediate family when I was back in RI. Mom made a batch of these yummy blondies (and gleefully crowed about the secret ingredient when certain family members couldn’t guess what it was), the adults all sang “Happy Birthday,” and Teddy snoozed away. I received gifts from my parents that night and gifts from some other relatives at various points during my visit. It was low-key and lovely – just the way I like it. On my actual birthday, the 15th, S and I kept it equally low-key. We decided to have dinner at Tex Tubb’s Taco Palace, a taco-centric establishment that we’ve been meaning to visit for a while. We were seated after a short wait, and we promptly ordered drinks – a Shiner for S and a blue agave margarita for me – while perusing the vegan menu. We wanted to order their vegan nachos as a starter, but the waitress abashedly informed us that they were out of vegan queso. Boo! Instead, we got chips and a cute tub of guac. Yum! This guac was perfect – creamy, simple, and fresh. The diced tomatoes and onions on top (not mixed in!) were a nice touch, and the portion size was perfect for the both of us. 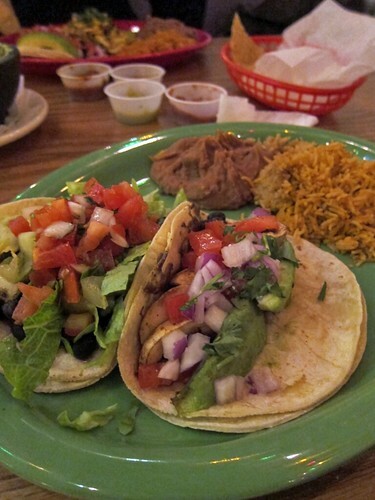 Actually, it might’ve been a little large for me – I couldn’t quite finish the two tacos I ended up ordering! 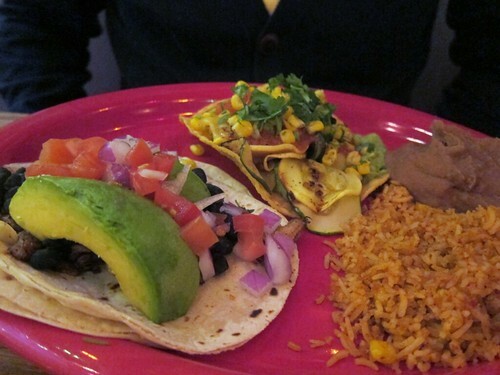 I went with the two-taco plate and chose the Avocado Frito (fried avocado, mushrooms, black beans, tomatoes, and red onions on corn tortillas) and the Black Bean Something or Other (no list because it’s not on the online menu, but it was pretty similar to the other one). The platter came with a side of beans (I chose refried) and rice. S and I both saved one of our tacos for later, and I saved some of my rice and beans, too. They made great leftovers! Sew myself a dress. FAIL. Drive in a big city. FAIL. Send people birthday cards and gifts on time. Completed! Work out weekly. Completed! (Very proud of myself for this one. I know it’s not much, but it’s consistent, and I’ve never been good at keeping up a consistent workout schedule. I intend to amp it up in the next year! Learn how to use InDesign. Um… I used InDesign to make the invitations to my sister’s baby shower, but I’m no expert. Not quite completed! Knit myself a sweater. FAIL. Do more creative writing. Completed! Nobody will ever read it, but whatever! Start making Christmas gifts during the summer. Completed! Make a pie with a lattice crust. Completed! Re-learn how to crochet. FAIL. Knit a pair of socks. FAIL. Call (or write to) far-away family and friends more frequently. Completed! Visit a new country. Completed! Do more hands-on volunteering. Completed! Super-secret private goal! This is an ongoing goal. But I made progress! Super-secret private goal! Errr… nope.